I was hoping to have this series of analyses of the 44 wards complete last week, however many things got in the way. But with my life getting back to normal, and with my eagerness to move on to new projects, I bring you the penultimate post in the series the results of the 2014 municipal election. 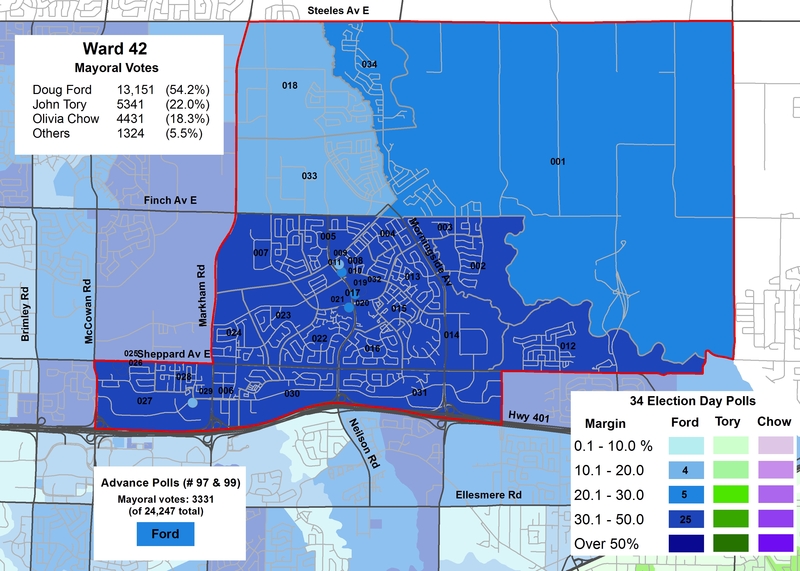 In this post, I look at Wards 41 and 42, Scarborough-Rouge River. Ward 41 is represented by Chin Lee, Ward 42 by Raymond Cho. Despite the Fords’ popularity in northeast Scarborough, neither councillor was much of a support of the Ford agenda in 2011-2014. Raymond Cho, despite his Conservative leanings, voted with Ford less than 20% of the time, while Chin Lee voted with Ford 36% of the time, according to Matt Elliot’s Council Scorecard. In Ward 41, which is located north of Highway 401, between the GO Stouffville Line (CN Uxbridge Sub) and McCowan/Markham Roads, Doug Ford came in first place in all but one poll, 014, where Olivia Chow won. Poll 014 represents one of several Yee Hong Centres for Geriatric Care. 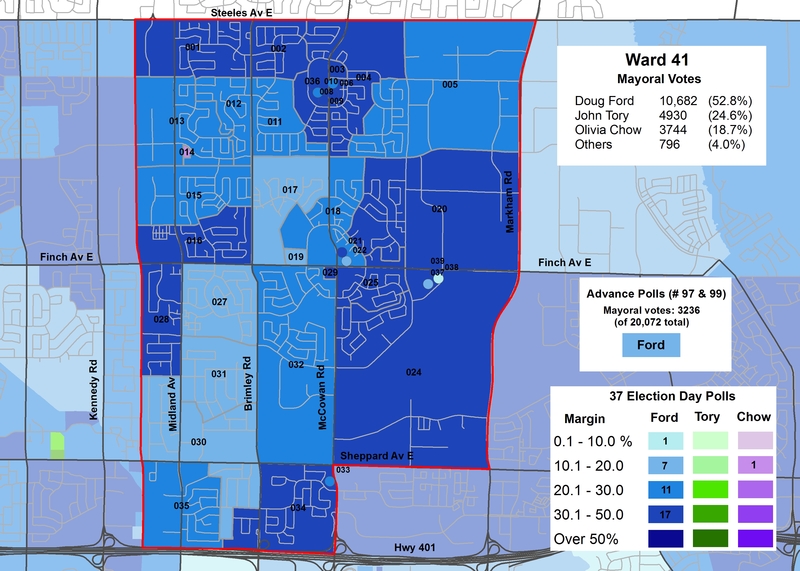 In Ward 42, which covers the Malvern and Morningside Heights neighbourhoods, as well as the Toronto Zoo and much of Rouge Park, Doug Ford came in first place in every single poll, doing best in the Malvern neghbourhood, but with less support in the newer subdivisions of Morningside Heights to the north of Finch Avenue. John Tory did not win a single poll in either Scarborough-Rouge River ward. Both incumbent councillors, Chin Lee in Ward 41, and Raymond Cho in Ward 42, were re-elected, though Cho faced serious competition. 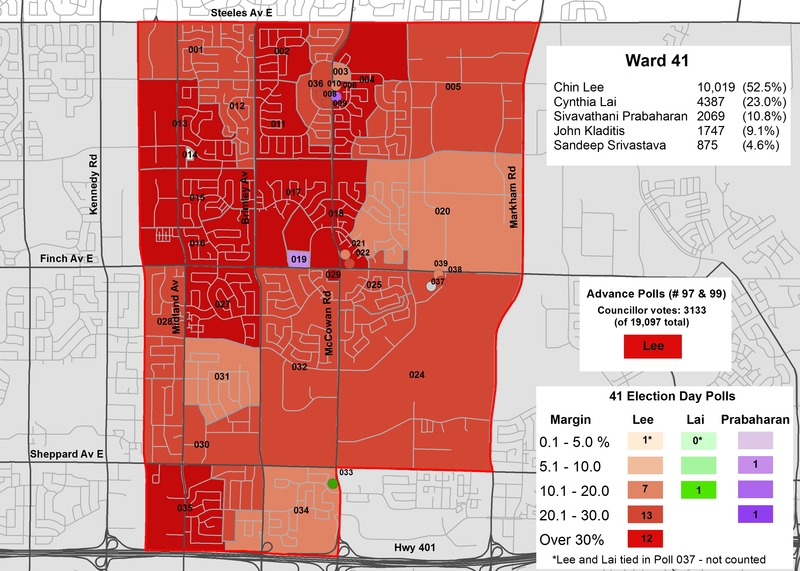 In Ward 41, Chin Lee was re-elected with 52.5% of the vote, coming in first place in all but four polls. Second-place candidate Cynthia Lai netted 23.0% of the vote, coming in first in only one poll (and tying Lee in one other); third place Sivavathani Prabaharan came in third place with 10.8% of the vote, winning two polls. Neethan Shan, president of the Ontario NDP and a former York Region District School Board trustee, was looking to try to unseat Cho a second time. In 2010, Shan came in a respectable second place, netting 6873 votes and 33.6% of the vote, but losing to Cho, who won a majority (52.9%). Shan certainly had name recognition in the ward, something that many challengers lack. Earlier in 2014, Shan ran for the NDP in the provincial election, coming in second place to Liberal incumbent Bas Balkissoon. Cho also ran in that election for the Progressive Conservatives, but he came in third. (Cho’s decision to run for the Ontario PCs surprised some City Hall observers, given Cho’s moderate politics and his opposition to the conservative Ford agenda. After all, Cho ran for the federal NDP in 1988 and as an independent candidate in 2004 as an “independent Liberal.” Cho’s success in municipal politics did not help him in his bids for federal or provincial office. In 2014, Neethan Shan was endorsed by the Toronto Star, NOW Magazine, and the Toronto and York Region Labour Council, but again failed to unseat Cho. Shan won 500 more votes in 2014 (7393) but a smaller percent of the vote (31.1%) in a crowded field of eleven candidates. Cho won his seventh straight municipal election with 49.5%, and all but 3 polls. This entry was posted in Election, Maps and tagged 2014 Election, Scarborough, Ward 41, Ward 42. Bookmark the permalink.